The last month or so has been a wild ride. Lots of shooting and lots of assisting. Of course, this can cause a not-so-timely posting of images and projects. So over the next week or so there will be several posts being made while I attempt to catch up to now. Just over a week ago, the 5th issue of Regale Magazine was released. I was asked to create some photography for a few of the stories that would be in this issue. The majority of the content of this issue was related to technology and two of the images that I created were playing within that theme. 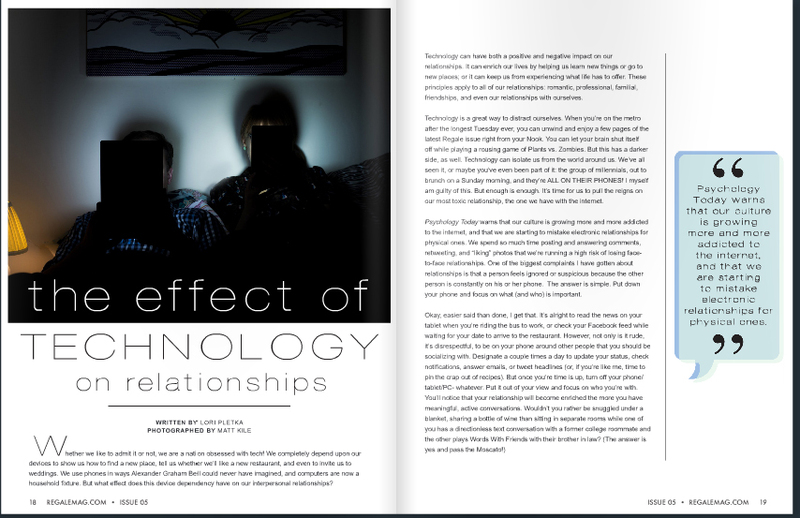 The first story was that of the effect that technology has on relationships. Being someone who is immersed in technology nearly every second (for better or worse) and with the understanding that technology and relationships are both very complex intangibles, I chose to create something literal with a bit of historical relevance. Playing off the sort of cliché idea of someone reading a book in bed with the bedside table keeping the other awake, I wanted to update just a bit to make the connection between this classic idea and the current technological state. The second piece that I was asked to create was about Instagram and why it should be used. Admittedly I am not exactly the best at Instagram and because of that, the conceptualizing process was not easy for me. What ended up being the focus of the image was something I was almost completely unaware of as being a thing. 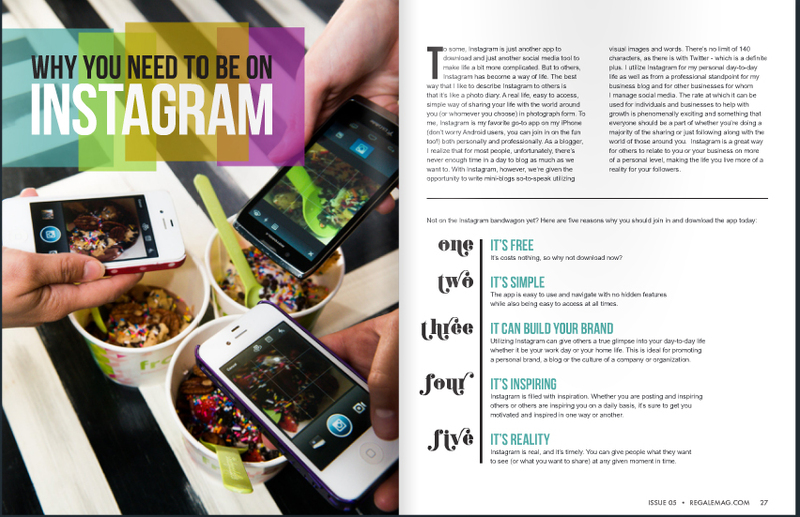 Instagramming your creation at Froyo. Working quickly was essential for this shot and I am still not satisfied with the result. Using speed lights to light the surface was tricky as the screens of the phones were all rather dark in comparison. Using a slow-sync was just barely allowing me enough time to expose for the phone screens before motion blur and shake became a real issue. Though the issue is already running, I haven’t abandoned the idea that a successful image is hiding in here somewhere. The third assignment for this issue was another departure for me. Not in photographic terms, I am very familiar making this type of work. Rather, the content was something that took me a minute to wrap my brain around. 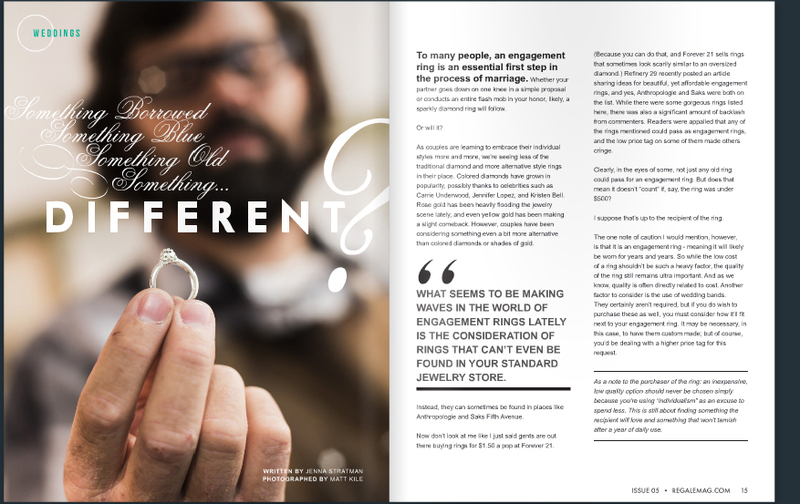 I was asked to create a few pieces to accompany a story on what are called alternative engagement rings. Not being familiar with regular engagement rings, this took some research. Eventually, I discovered Adam Foster. Foster is a jewelry maker and artist in Saint Louis focusing on the custom and non traditional. 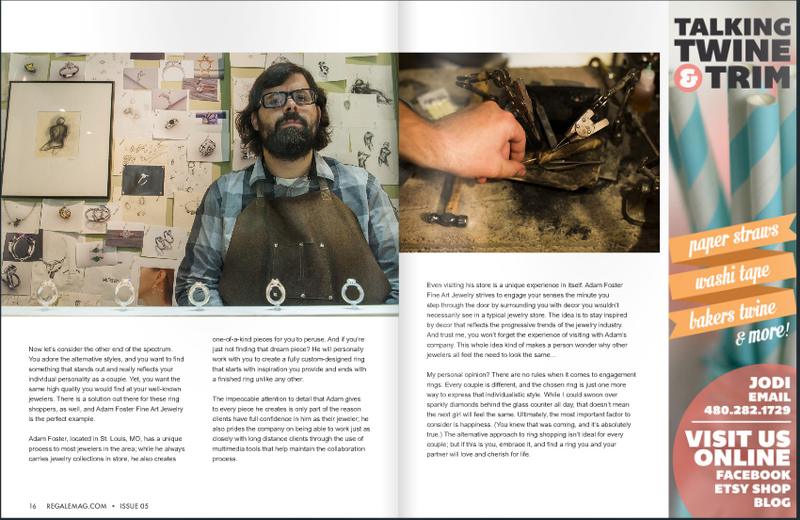 I was able to visit his storefront and workshop for an inside view on alternative jewelry. It is always great to be able to take a look into what another artist is doing and what their space is like. I am someone who romanticizes process and really love seeing the process that artists go through to create their work. I will be making another post with a few more images of Adam, his work and his space soon and I plan to go back in the future to make an extended body of work. As always I enjoy a good challenge when trying to cover something or make art to contribute a visual element to a story. I will be looking forward to the next challenge and the next time I am taken out of my comfort zone for the sake of photography. Posted in Assignments, PersonalTagged assignment, editorial, Freelance, freelancing, magazine work, Personal Work, photography, portraitBookmark the permalink.